Twenty one missions were built in southern California as part of the Spanish colonisation of the eighteenth century, from San Diego de Alcalá in the south - the earliest to be constructed, in 1769 - to San Francisco de Solano in the north. All have a similar layout centered on a large whitewashed church next to an enclosed quadrangle with various other buildings for storage, housing, construction, etc, and served as bases from which to explore the surrounding territory and spread Christianity to the native American Indians. Both these needs declined after the mid nineteenth century after which most of the California missions fell into disuse. Those that remained functional were subject to rebuilding and additions over the years, and extensive restoration has taken place at some of the others so in many cases little of the original structure remains, however the buildings still look authentic and are now focal points for tourism as well as still being used for regular Catholic church services. 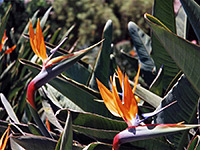 Most have museums and large gardens filled with exotic plants, and stage religious and other events. All missions are within a few miles of the old road known as El Camino Real, the majority of which is now US 101, and are generally found in suburban settings - see map. Descriptions of the four southernmost California missions are given below, plus a summary of the others. First built of the 21 missions, San Diego de Alcalá is located seven miles north of downtown San Diego in a quiet, leafy part of the suburbs yet close to several main roads and the I-8/I-15 interchange. The centerpiece is the church with its distinctive three-tiered belltower, old-looking and authentic in design though most dates only from the 1930s, when the then partially ruined building was extensively restored. In front is a small, well established garden containing flowers and blossoming bushes - a photogenic scene, and the mission is a popular place to visit. A small walled garden adjoins the side of the church filled with more bushes, trees and cacti, while nearby is a small museum with the obligatory gift shop and several other buildings of more historic interest. The second mission northwards, San Luis Rey de Francia, sits at the side of the wide San Luis Rey river valley four miles east of Oceanside, in a rural area of cultivated fields and small villages. The buildings are quite imposing, centred around a large church made in the traditional Spanish colonial style with a gleaming white appearance as if recently repainted. To one side lies a large enclosed quadrangle lined with colonnades and containing a lawn and gardens including, of incidental interest, the oldest pepper tree in California. A cemetery dating from 1780 occupies ground at the other side while the land in front of the church has ruins of other historic structures principally barracks, kilns and an aqueduct. The frontage is bordered by examples of Californian desert plants including several huge yucca while in front is an large parking area with extensive lawns, a good place for a picnic. San Juan Capistrano is a pleasant town along I-5, four miles from the Pacific Ocean and just about at the southern end of the Los Angeles suburbs. The mission of the same name was the seventh to be established, in 1776, and has remained in active use ever since. 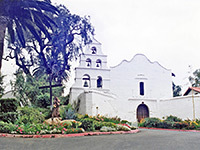 It is one of the most popular in terms of visitation and has extensive buildings including a church and chapel, barracks, warehouses, a cemetery, a jail, an industrial center (ruined) and various rooms used as museums, with exhibits of both the history of the mission and Spanish settlement in California. 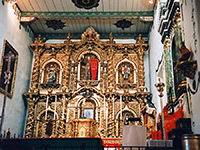 The adobe Serra Chapel is the oldest building in the state and contains a gold covered altar originally from Barcelona in Spain which is thought to be over 300 years old. The mission has one large enclosed central courtyard and other associated gardens, all with flourishing trees, wildflowers, cacti and succulents, fountains and statues, and several hours could be spent exploring all the different areas. 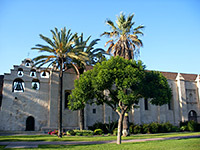 Fourth of the California missions is San Gabriel Arcángel, founded in 1771 and moved to its current location in 1776 because of flooding; once in the middle of the countryside, the site is now surrounded by the northern Los Angeles suburbs of San Gabriel, near Alhambra, Rosemead and South Pasadena. The old highway past the church (Mission Road, originally El Camino Real) now cuts diagonally across the regular San Gabriel street grid, through a bustling, densely populated neighborhood home to a high percentage of Chinese Americans. The mission sits beside the road next to a large parking area, and has an aged but solid appearance, with tall buttresses, small windows thick set walls - functional rather than ornate, though embellished by a handsome six-bell wall (campanario). 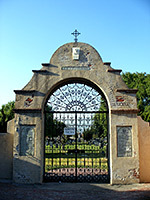 The church is part of a group of buildings that also includes a refuge, school, museum, cafe with cactus garden and a new Catholic church, next to which is the historic Mission Cemetery, containing around 6,000 graves. All the complex is peaceful and evocative, despite the busy main road nearby, and the modern surroundings. The remaining 17 missions are found at intervals of 40 miles or so northwards, mostly well inland but a few are almost beside the coast. San Fernando Rey de Espana (founded 1797) has a rather incongruous setting in the middle of the I-405/I-5/118 triangle in Mission Hills, north Los Angeles, and is largely reconstructed, following damage that occurred at various stages including an earthquake in 1812. On the west edge of Ventura, Mission San Buenaventura occupies quite a small site, in which the only original elements are the church and a garden. 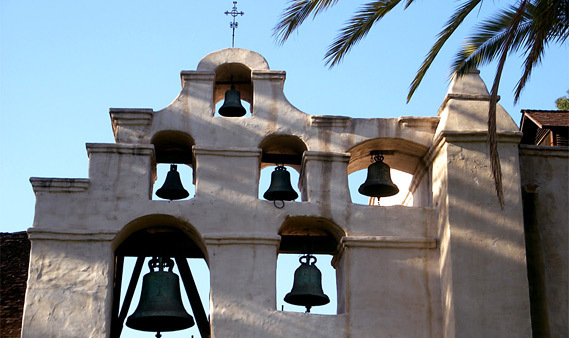 Mission Santa Barbara is located 30 miles further northwest along US 101, in the foothills of the Santa Ynez Mountains overlooking the city of Santa Barbara; highlight is the ornate brick-built chapel, surrounded by the usual gardens, colonnades and outbuildings. The next three missions northwards are Santa Ines, along Hwy 246 in Solvang, La Purísima Concepción just outside Lompoc (protected as a state historical monument), and San Luis Obispo de Tolosa, another compact site right in the middle of downtown San Luis Obispo. In contrast, San Miguel Arcángel has a quiet, countryside setting alongside US 101 on the south edge of San Miguel, near the Salinas River. Next mission northwards is San Antonio de Padua (established 1771; this the most remote in the state, built far from any main towns in the coastal mountains, now completely surrounded by Fort Hunter Liggett Military Reservation though still open to daily visitors. Nuestra Señora de la Soledad is another rural mission, in farmland south of Soledad, and consists only of a restored chapel, courtyard, garden, and the adobe ruins of several other structures. On the south edge of Carmel, Mission San Carlos Borromeode Carmelo has an attractive and authentic appearance, lined with palm trees and floral plants, and looking out over wooded hills beside the coast. 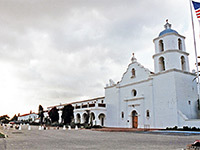 San Juan Bautista is the largest of the 21 missions, situated on the east side of the small town of the same name, between Salinas and Hollister. Nearby Mission Santa Cruz is built along highway 1 in Santa Cruz city center, 2 miles from Monterey Bay. The next four missions are located in cities, around San Francisco Bay: Santa Clara de Asís, San Jose (in Fremont), San Francisco de Asís (Mission Dolores) and San Rafael Arcángel, all part of urban neighborhoods. The furthest north of the 21 Spanish missions is San Francisco Solano, the main attraction of Sonoma State Historic Park in the suburbs of Sonoma.